Most of our Spanish students ask us different questions related to Spain. Most of them like our culture and our way of living, although they don’t understand several things such as why we keep dropping litter at the bars (aunque no entienden por qué seguimos tirando basura en los bares): napkins, cigarette butts, pits, shells… The floors of the bars are full of this kind of stuff (servilletas, colillas, huesos, cáscaras… Los suelos de los bares están llenos de esta clase de cosas). Do you think you know Spain? Perhaps our list below might tell you something you don’t know yet…. There are four official and co-official languages in Spain: Castillian (what most people think as “Spanish”), Galician (spoken in Galicia), Euskara (spoken in the Basque Country) and Catalan (spoken in Catalonia). In Spanish we call these languages castellano, gallego, euskera o vasco and catalán. The population of Spain is approximately 45 million: the 6th largest in Europe. Spain “owns” two cities in Africa: Ceuta and Melilla (ciudades autónomas). There are 17 Autonomous Regions (Comunidades Autónomas) in Spain: Andalucia, Aragon, Asturias, Cantabria, Castile La Mancha, Castile Leon, Catalonia, Extremadura, Galicia, La Rioja, Madrid, Murcia, Navarre, The Balearic Islands, The Basque Country, The Canary Islands and Valencia. The capital of Spain (Madrid) is the highest capital city in Europe since it’s 667 meters above sea level (ya que se encuentra a 667 metros sobre el nivel del mar). Spain is geographically the closest country to Africa (geográficamente, España es el país más próximo a África): at its closest point, the region of Andalucia is 8 miles (14 kilómetros) from the coast of Morocco. Spain produces around 44% of the olive oil consumed on Earth (España produce el 44 por ciento del aceite de oliva que se consume en la Tierra). Spain produces double the amount produced in Italy and four times the amount produced in Greece. One region in particular (Jaén) is the super-producer of olive oil (approximately 25%). The 16th Century can be called “The Spanish Century” due to the power exhibited by the empire of Spain. Spanish is a Romance language, since it comes from vulgar Latin. Therefore, it is similar than Portuguese, French, Italian and Romanian (el español es una lengua romance ya que proviene del latín vulgar. Por tanto, es similar al portugués, francés, italiano y rumano). The Spanish language contains about 10,000 Arabic words according to the Royal Spanish Academy (RAE). The word ‘ojalá’ (hopefully) comes from Arabic and it literally means “and may God” (la palabra ‘ojalá’ proviene del árabe y literalmente significa ‘y quiera Dios’): “¡Ojalá venga (él) pronto!” (I hope he comes soon!). 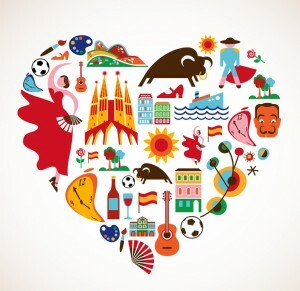 The staff of SpanishviaSkype loves Spain and its culture. Do you want us to explain it to you? Give us a try!